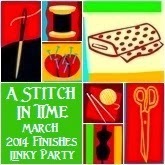 for her Let's Book It Linky Party. 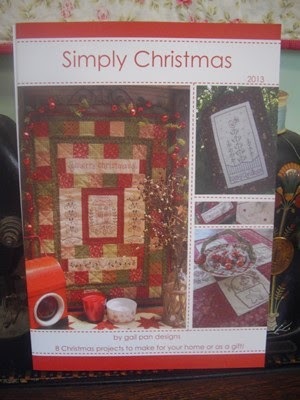 I've had this book "Simply Christmas" by Gail Pan for a little while now and have chosen a project from here. This is the project I chose. 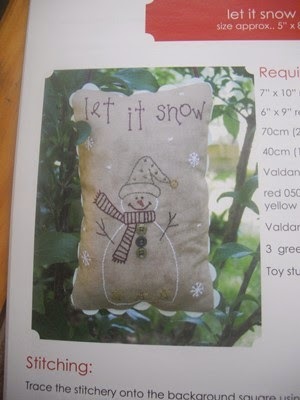 "Let It Snow" hanger. 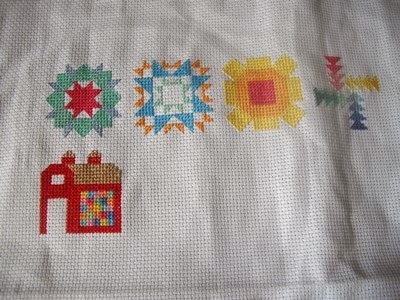 have made a good start on the stitching. other books people are crafting from. 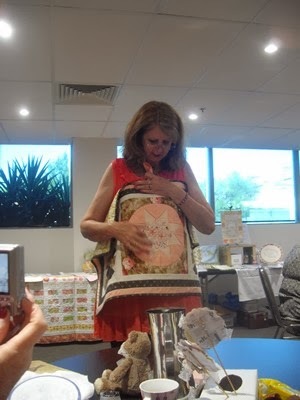 Thank you to Kelly from Quilty Pleasures blog. 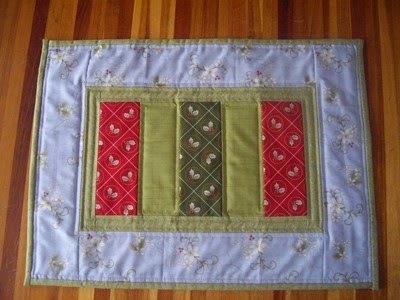 Quilts from Quiltmaker's 100 Blocks. Friday Night Sew-In and My Giveaway Winner! 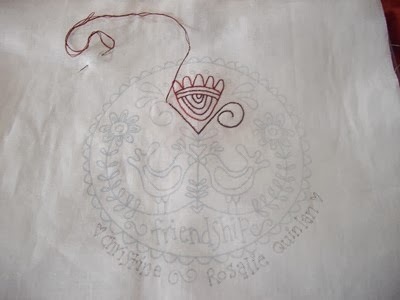 I managed to get a little stitching in last night between running around dropping off and picking up the boys! 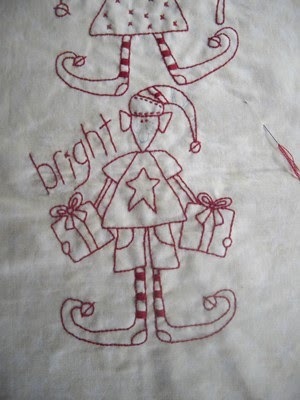 The third elf on my stitchery is just about finished. to see what everyone else got up to last night. I still can't work out how to do a copy of the Random Number Generator to go onto my blog so I took a photo of the screen. 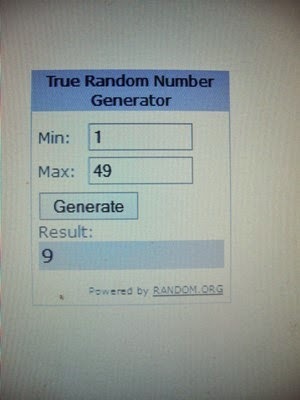 The RNG selected number 9. And the winner is . . . . . . . . .
from The House on the Side of the Hill. Thanks to everyone who took part in my giveaway. I'm sorry I can't give you all a prize. Sandi of A Legacy of Stitches last year. 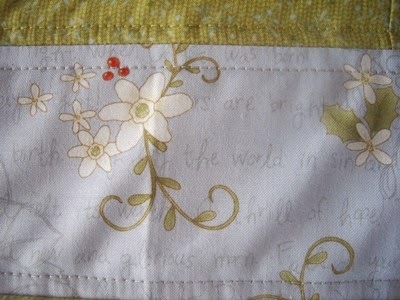 The border fabric is so pretty. 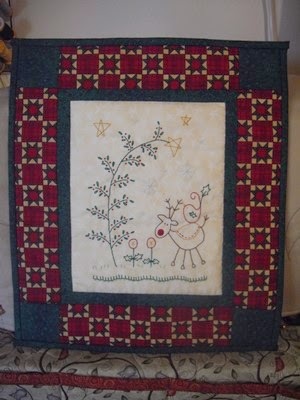 And Elizabeth for A Stitch In Time. Tonight is Friday Night Sew-In. 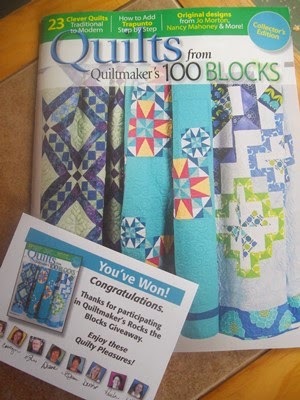 Head over to Wendy's (Sugarlane Quilts) to sign up. 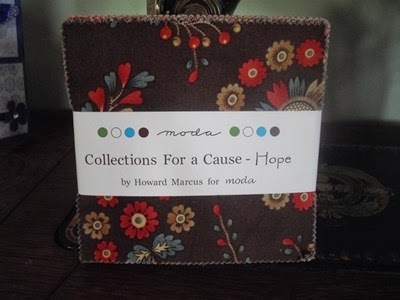 Today is the last day for my 500th Post Giveaway. You have until midnight tonight (Friday) to enter. 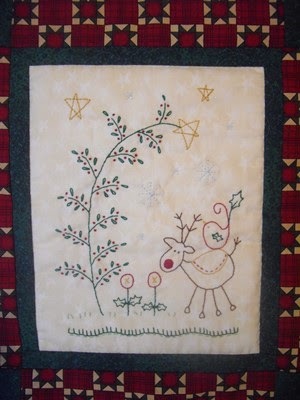 My first Christmas finish for 2014.
which was published in Quiltmaker Magazine. I think this has come out rather nice. Elizabeth at Such A Sew and Sew. 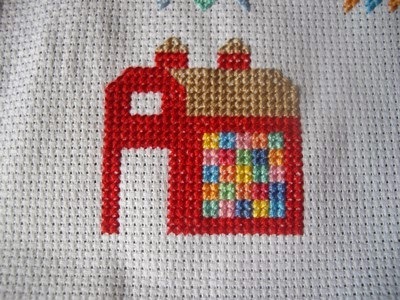 I've built a barn of cross stitches! and I've already finished it! Sorry for all the crinkles! 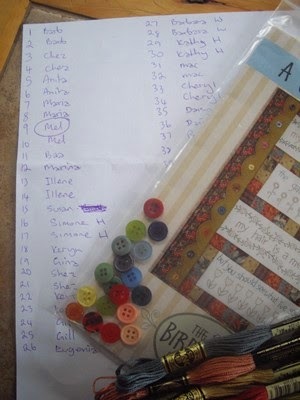 Don't forget my 500th Post Giveaway. You can find it here. There's still time to enter. Yes, cricket finished Friday night and now the 2014 footy season is about to start! No rest for the wicked! LOL! Austin and Nelson have practice matches today. Unfortunately, they are both playing at the same time. to Austin's as he is Medic. 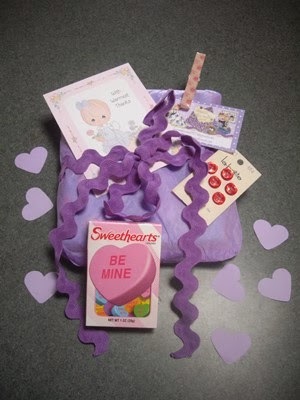 Runners Up and a Giveaway! 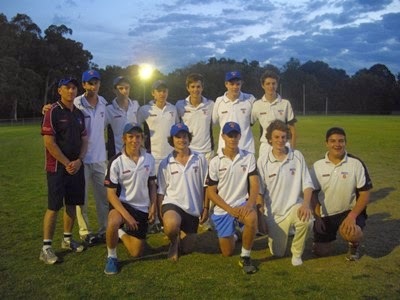 Last night was the second day of play in Mitchell's cricket Grand Final. Unfortunately the boys weren't able to make the runs. They did their best while playing against a very unsportsmen like team. At times it got quite nasty but our boys can hold their heads up high. They did not retaliate at anytime and played the game in the way it should be played. One of the opposition was reported for a nasty incident. I've never seen someone be reported in a cricket match before! in the way they did. Congratulations on a great effort boys. Now I mentioned a giveaway. This post is my 500th one! and you still keep coming back! 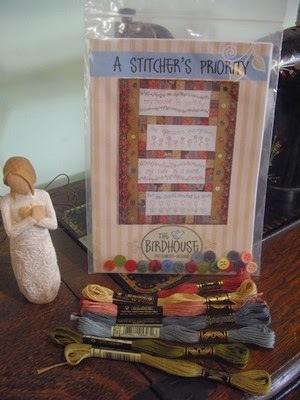 The lucky winner of my giveaway will receive A Stitcher's Priority pattern by The Birdhouse, buttons and DMC threads to get you started on the wall hanging. By the way, do you live in Western Australia? 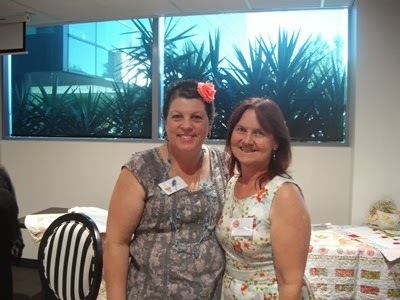 Anthea at Hibiscus Stitches is hoping to arrange a blogger get together for all the WA girls in Perth. 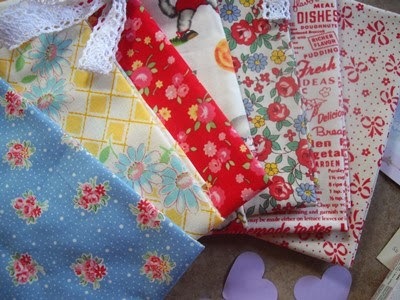 Anthea is hoping to arrange a meet up at the Craft and Quilt Fair in May. Here is the link to find out the details. by Pam Kitty of Pam Kitty Morning. so it's nice to now have some. Aren't they just lovely! and a very pretty floral peg. Today is Athletics Day at school. Meers House have the theme of Australia. Here are the boys already to go. Nelson is ready to cook the snags on the barbie! Good luck Mitchell, Austin and Nelson. 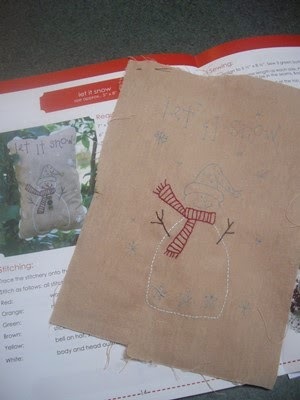 even managed to get a little stitching done! 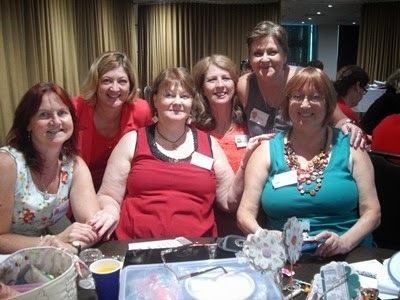 Dawn, Joy, Vicki, Fee, Marilyn, Jenny, Vikki and Rosalie. 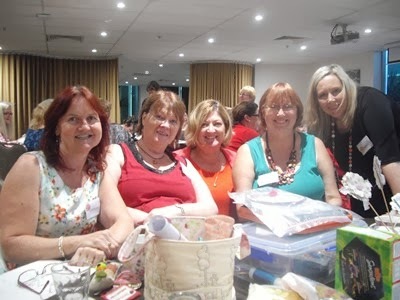 Vicki Tucek (The Pickledish Patch), Dawn Hay (As Sweet As Cinnamon), Fee Ransley (Mum's Cupboard), Jenny Reynolds (Jenny of Elefantz) and Joy Coey (Joy Patch) welcomed everyone. 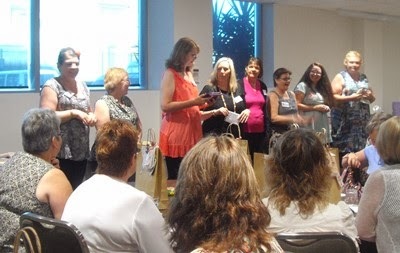 They then introduced the two mystery designers for the day, Vikki Collumbine (Sew Useful Designs) and Marilyn Duncan (Mardi Meanderings). Those two had kept their secret so well over the previous couple of days. Not even their closest friends knew! Then as an extra surprise, out from behind the curtain came Rosalie Quinlan! 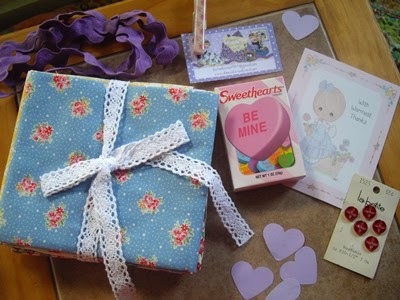 my pretty little tins out of the photo! Vicki, Jenny and Mel (The House On The Side Of The Hill). With Shez, Sue, Mel and Fee. Vicki explaining part of her project. 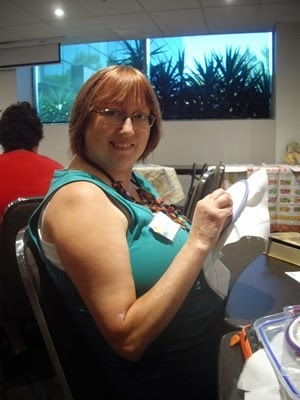 Proof that Mel did some stitching. Although she may just be pretending! This is what I managed to get stitched. More than I thought I would! I decided to start on the project Rosalie gave us. 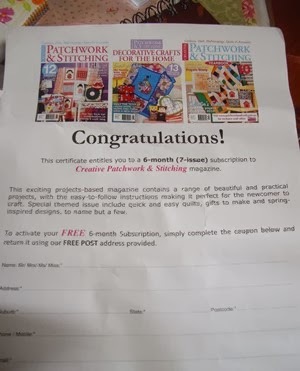 I was lucky enough to win one of the raffle prizes. 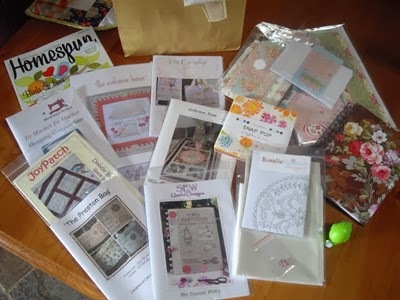 I'll share the lovely projects from the girls in another post. I think this one is long enough! 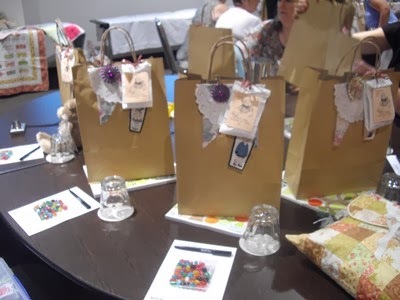 We had a fantastic time today at the Let's Get Stitched Stitching Day. But I'll tell you all about that in another post. A less dramatic day at the river. 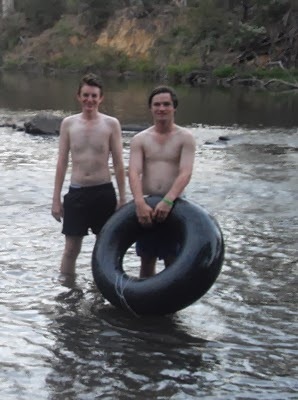 While I was having fun with the girls, Noel took the boys back to their favourite swimming place at Warrandyte. There Mitchell, together with his mate Dale, helped save a man who was struggling in the river and in quite a bit of trouble. Mitchell got to him first and the man, in his panic, pulled Mitchell down but Mitchell was able to get up and then he and Dale got the man to shallow water. Apparently they got quite an applause when they got back to the edge. Well done Mitchell and Dale. We are very proud of your bravery. 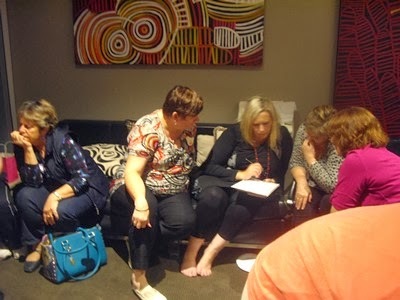 Mucking Up and Fun and Games! Last night was "Muck Up Night" for the Under 15's at Little Athletics. 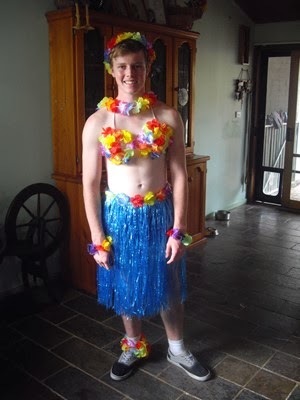 It is a traditional night where the Under 15's dress up and have fun. For some of them, this is their last year at Little Athletics as they decide to head to senior athletics. 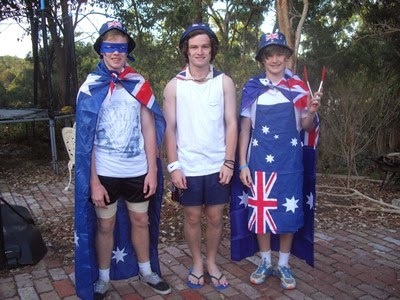 Austin and his mates are planning to go back next summer for Under 16's. He might also do seniors as well. 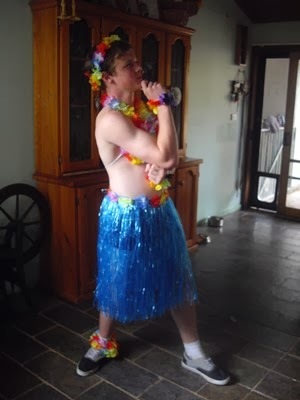 As we now have lovely Hawaiian costumes, Austin made use of his one. Nobody raced properly last night. There was skipping, twirling, cutting over the tracks, go slow starts and ended with a massive water fight with the girls! When it was time for Triple Jump, Austin did a backflip into the sand pit! I think they all had a great time. 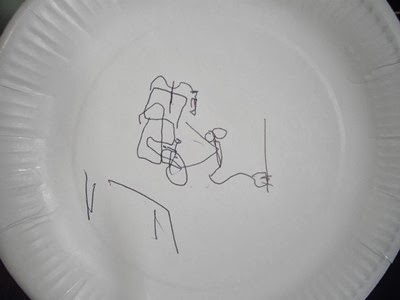 As for Let's Get Stitched, it was Pizza and Games night. After munching away on pizzas, the fun and games began. 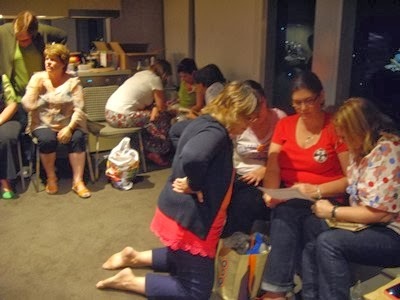 Here is everyone concentrating hard on working out the scrambled quilting related words. This had to be the quietest point of the night. 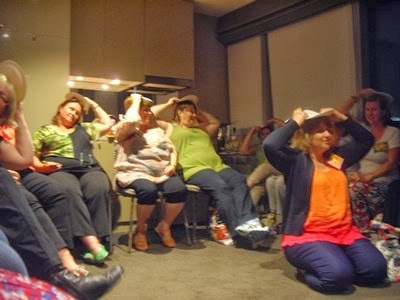 In fact, there was so much laughter that at one point Security came to ask us to be quiet! Naughty, Naughty! LOL! 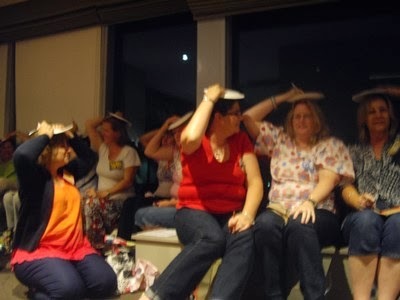 This game we each had a paper plate and had to balance it on our heads. Dawn then told us what we had to draw! Well, I'm sure you can imagine the laughter happening here. Can you see my sewing machine, complete with thread, fabric under the needle, pin cushion, scissors, power cord in the wall, all sitting on a table? What, you can't! We also had to bring a charm pack in a paper bag. After passing them 3 to the left, 5 to the right, 2 to the right, 8 to the left, etc, this was the charm pack I came home with. 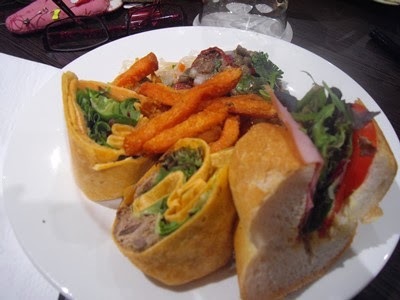 Tonight we're off to dinner, so it should be another fun packed night with lots of laughter. Tomorrow is the big one. Stitching Day! I don't know how much stitching we'll manage to get done but who cares! 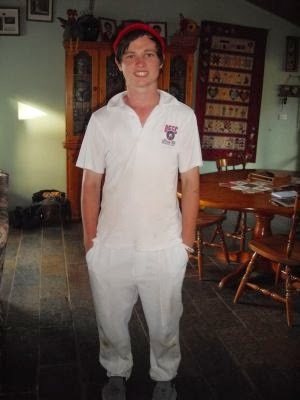 Update on Mitchell's cricket. They got the opposition out for 100. Banyule are 1 for 5 and Mitchell is in batting. Stay tuned for next Friday's update! 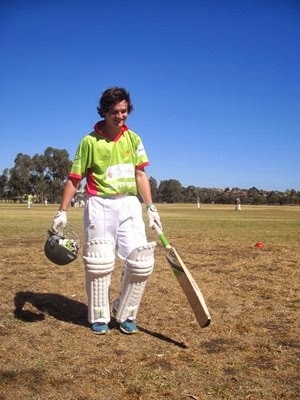 This Summer, Mitchell was asked to join the Banyule Cricket Club Under 18's team. Diamond Creek doesn't have an Under 18's, so he said yes. Tonight they are playing in the Grand Final and will continue it next Friday. But I'm going to be a bad mother as I won't be going along to watch him. 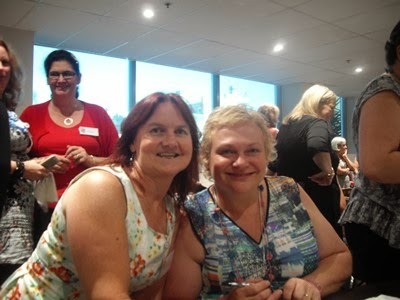 I'll be with Mel, Shez and all the other girls at the Let's Get Stitched Pizza and Games Night! When I booked in months ago, Mitchell wasn't going to be playing Friday nights. But I'll definitely be there next week and Noel will keep me updated by text. Good luck to you and your team Mitchell. Play your best. 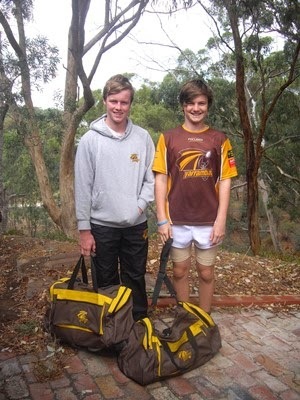 Mitchell in his Banyule Bears uniform. Will have to do something about that!